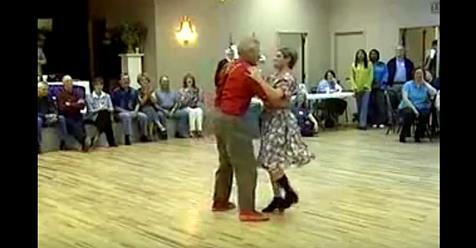 Pete and Beulah Mae spared no energy for this incredible dance. For years they have dance together, but this time was special. People watched them approach the dance floor and thought it was a joke, not even being able to keep their giggles to themselves. But the music began playing, and the loving couple took their chance. The opportune moment appeared right before their eyes, and they didn't waste a single moment. Enjoying every second of the spotlight, Pete and Beulah Mae continued dancing with all the enthusiasm they had within themselves. They swung back and forth, and became the most popular couple there. What seemed hilarious at first turned into quite a show. No one was expecting such a talented routine from these two, but boy were Pete And Beulah Mae ready to prove them wrong.